As January is already flashing before my eyes, I thought it was a good time to take a moment. Recently, my other half and I were out driving and he suddenly stopped the car and said – “this is a right spot for some photos” – I love him. 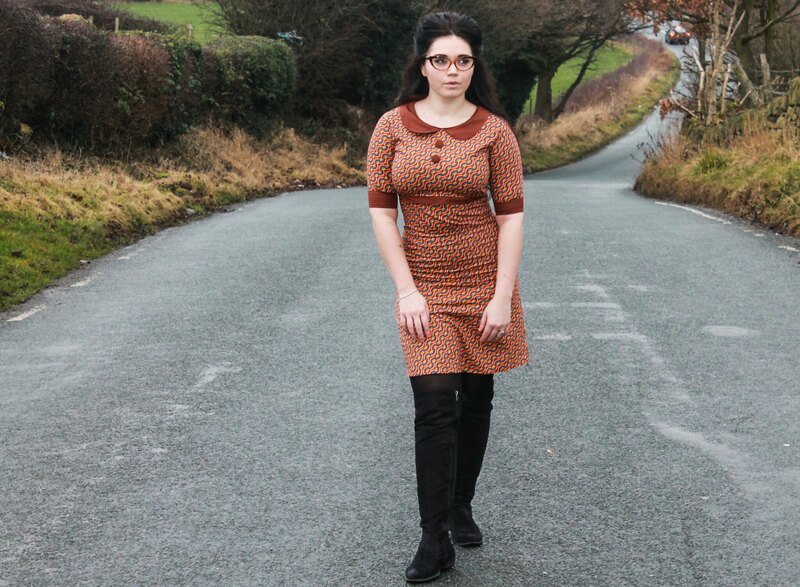 I was wearing the “Freak Out” dress from one of my favourite sixties reproduction brands – Madcap England and my old faithful black knee boots from New Look that I bought a few years back. You know when something just fits you well, your sass levels are at their maximum and you have great hair – well this day was one of those days. Today was a good day to take a moment. 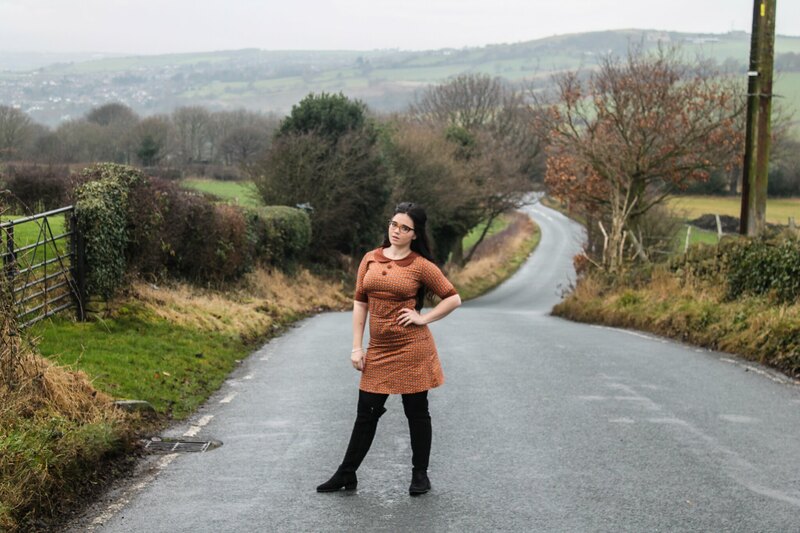 The “freak out” dress comes in so many colour ways – my beautiful friend Atomic Amber has the turquoise colorway (see bottom of this post for her pics!) and it is one of those dresses that I could own in every colour. The three quarter cap sleeves are really flattering, I love the collar detail and the print is bright and colourful. 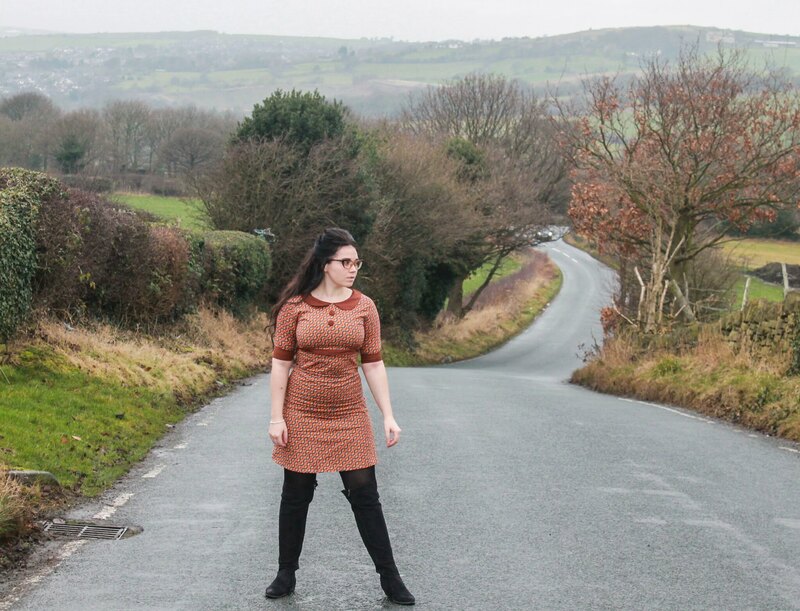 Like all the other Madcap England dresses that I have, they wash really well and just need a quick run over with the iron – they make ideal “grab and go” outfits. The length is great too – some might even call it conservative. If you are a mum like me, you don’t want to be crawling around in a mini skirt when your little one is on the move. Equally you don’t want to be tripping up over your hem either so this kind of length is just right. 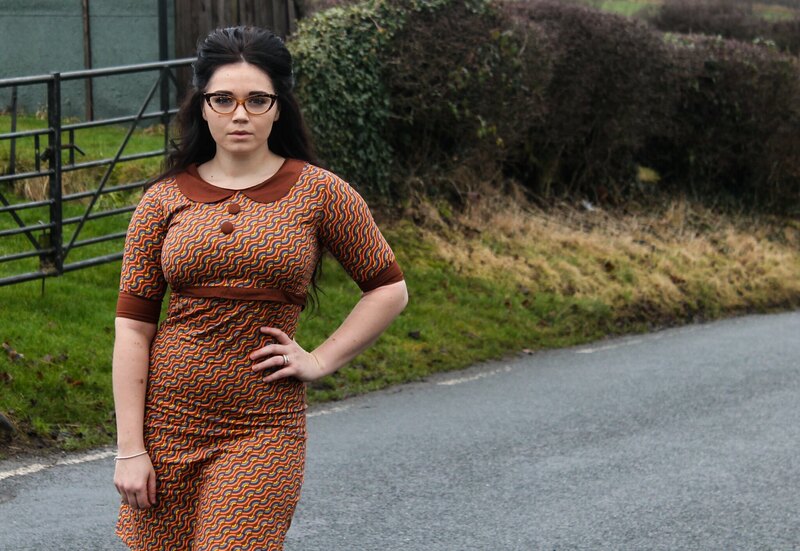 I wear them to perform in, the office, everyday and to go to gigs in, they are so versatile and every sixties lover needs one in their wardrobe for sure. 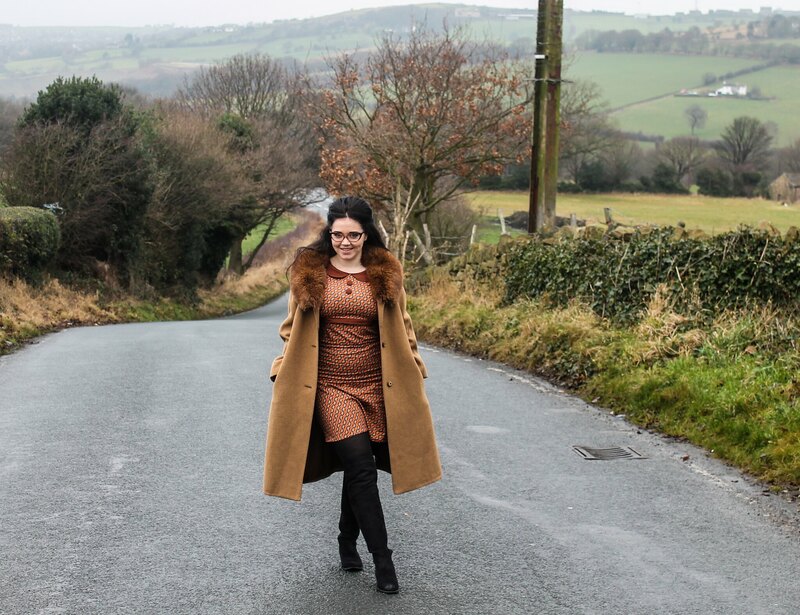 My husband takes most of the photos on my blog – every time I ask him to take a few snaps he gives me a roll of the eyes as he says okaaaaaay with an exasperated breath. Normally, I book in a shoot or a free day where either my hubs or another photographer can take some shots and we find a location. This day, it was literally as we were driving that my husband decided that this was the perfect spot. In that moment, he saw the winding roads and told me to hop out. Of course, being a country lane – there was traffic so we had to carefully time it right so I didn’t actually get run over. 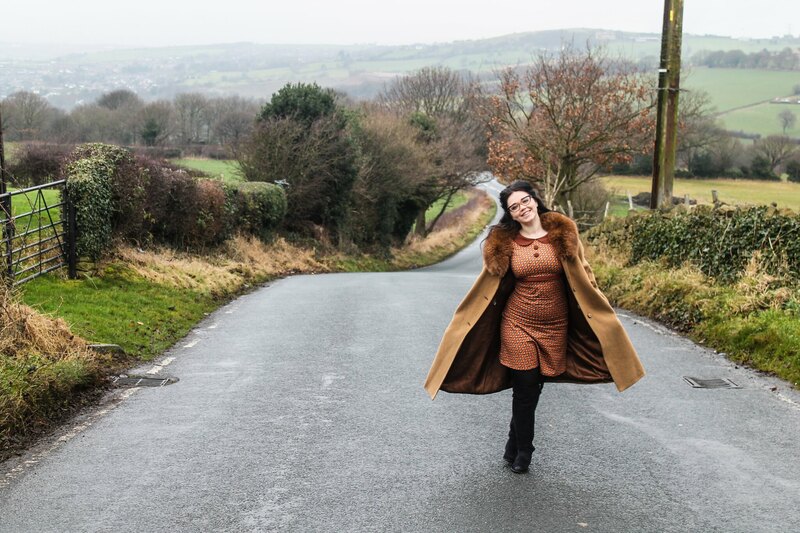 I think we captured just how care free and easy it is to wear sixties style and vintage when you are just out and about doing your every day thing. When you are out enjoying life – take a moment. You never know when that moment will be all you have and what better way to look back on it with a snapshot. Take more photographs, enjoy every second of life and look back on your own moments with a smile on your face. click the above pics to go to Amber’s Instagram post. Many thanks to my husband for photos & Madcap England for gifting.